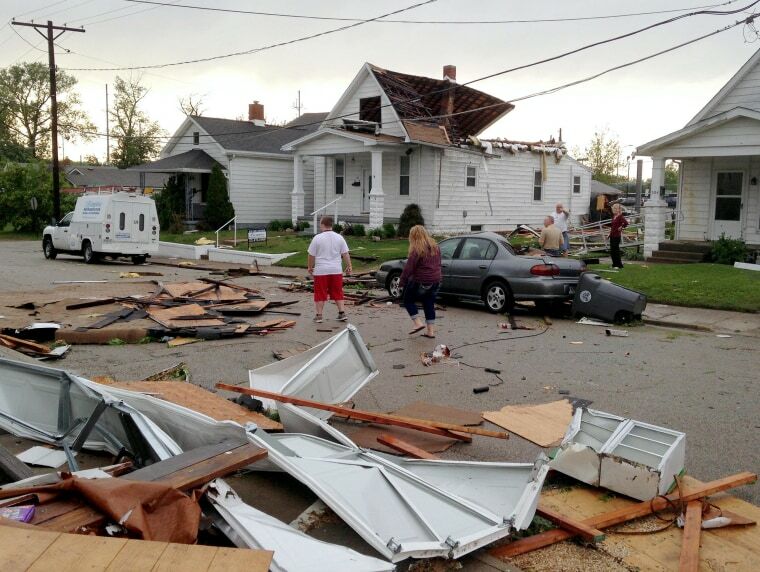 Multiple possible tornadoes were reported in Nebraska, warnings popped up across Iowa, and the governor of Missouri declared a state of emergency Sunday as a line of storms rolled through and threatened to spawn twisters and produce large hail. Forecasters from The Weather Channel warned that 3 million people, from the Plains to the Mississippi Valley, were in the path of possible “long-track” tornadoes, with Kansas, Nebraska and Iowa facing the greatest threat. In Missouri, where a tornado damaged 200 to 300 homes in the town of Orrick a day earlier, Gov. Jay Nixon issued an emergency declaration and urged people to stay alert and heed weather warnings. Counties in Iowa and Nebraska spent part of the day under tornado warning, but there were no early reports of heavy damage. Ten tornadoes had already touched down during the weekend in Missouri and Indiana, bringing wind up to 120 mph, which knocked out power and damaged hundreds of homes, according to The Weather Channel’s Greg Forbes. No injuries were reported. Northwest Oklahoma could also see “a strong tornado or two,” Weather Channel meteorologist Michael Palmer predicted. The thunderstorms accompanying the twisters were expected to bring flash floods from Kansas through Iowa and into parts of Wisconsin well into the overnight hours, and on Monday the same dangerously wet conditions are expected to plague Texas into eastern Oklahoma and western Arkansas, Weather.com said. The risk of tornadoes should lessen Monday, but the Great Lakes, Upper Mississippi Valley and central Texas could still see vicious winds and large hail, according to the National Weather Service. While the flatlands expected tornadoes, the higher elevations in Colorado, Wyoming and Nebraska got a late-season snowstorm, with accumulations varying from 3 inches to 2 feet depending on altitude, Palmer said.